Traffic problems in Bangkok and its vicinity are set to worsen this year as car sales continue to rise, the Office of Transport and Traffic Policy and Planning said earlier this year. Director-general Soithip Trisuddhi said there were more than 6,840,000 motor vehicles registered in the Bangkok area as of October 2011, up 6.2 per cent on the 6,444,000 in 2010. On average, 1,225 new cars were registered in Bangkok every day in 2011, increasing from 991 in 2010, while the total length of the city road network remained the same at 4,149 km. 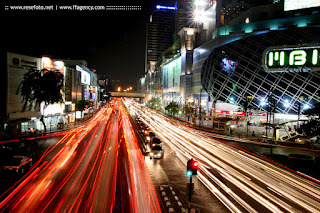 A classic traffic photo from MBK @ National Stadium in central Bangkok.